What Happens If You Keep a Goldfish in a Dark Room? Goldfish have long been popular as pets. However, goldfish actually should not be petted, because touching can remove the protective slime from their skin, making them vulnerable to fungal or bacterial infections, as well as parasites. Another interesting fact about goldfish is that if you keep one in the dark, it will lose its color because the pigment production of this fish depends on light. When deprived of light, the goldfish's skin stops producing pigment. Cells called chromatophores produce these pigments, which reflect light and produce color. A goldfish's color and pattern are determined by which pigments are in the cells, as well as how many are present and how they are arranged. Other animals that possess chromatophores include other fish, reptiles, amphibians and crustaceans. The most notable owners of these special cells are cephalopods -- octopus, squid and cuttlefish -- which can change color instantly to evade predators and to camouflage themselves from their prey. The chromatophore of goldfish have been manipulated through innumerable generations to give this fish its diverse range of colors and skin patterns and has resulted in multiple varieties. In addition, random mutations gave rise to strange features, such as google eyes and fins that resemble prom gowns. Goldfish varieties include the: bubble eye, butterfly tail, comet, calico, lionhead and pompom. "The popular image of a goldfish in a bowl is an enduring one ... but is hardly suitable for a fish," according to The New World Encyclopedia. 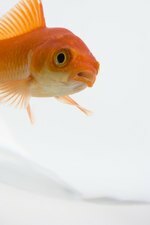 Goldfish excrete chemicals, both through their gills and their feces, which build up quickly in such a small environment and can cause sudden death. To combat this problem, use an aquarium with more surface area, which allows a higher concentration of oxygen to be diffused into the water. If the bowl is aerated by a pump, even more oxygen will be available to the fish. Goldfish should not be overfed, as they will stuff themselves and can develop fatal intestinal blockage. Most prepared food will come with recommendations regarding the amount a goldfish should eat. In addition, the New World Encyclopedia recommends that goldfish be fed fresh fruit and vegetables to supplement a flake or pellet diet and to prevent constipation. Contrary to popular believe, the goldfish's memory is longer than three seconds. In fact, goldfish can recognize and distinguish among shapes, colors and sounds, which they can remember for up to three months. They even can learn to push a lever for a food reward. This information supports the claims of owners who insist that their goldfish swim toward them but hide when they see strangers. Goldfish can be kept singly or in groups, called "troublings." They generally are friendly toward one another and rarely display aggression; the exception can happen during feeding, which is why you should keep only similar-sized fish together. Goldfish were domesticated more than 1,000 years ago in China. First golden, the fish were selected and bred for a variety of colors and color patterns. Goldfish actually are a type of carp and are found throughout the world. They grow up to 23 inches long and can weight close to 10 lb. They are capable of living 20 years, although most domestic goldfish live an average of seven years. Native goldfish live in tropical freshwater ponds, and their domesticated relatives also do well outdoors. Outdoor goldfish are beneficial because they consume mosquitoes and other insect pests. The ideal temperature range is 40 to 106 degrees. Wild goldfish usually are olive green, greenish brown or grayish. Domestic goldfish that are released into the wild usually cannot survive because their garish colors attract predators. If they do survive, however, their spawn eventually will revert back to the natural olive color of wild goldfish. Releasing domestic goldfish into the wild is strongly discouraged because they compete with native fish for resources and can damage populations of native fish. According to the Bristol Aquarists' Society, goldfish are "a delicious food fish." What Are the Signs of Pair Bonding in Discus Fish?